There is a longstanding and problematic connection between alcohol consumption and sport. Drinking often features heavily in post-sport celebrations for participants and spectators alike, and many sporting events and clubs are reliant on alcohol-industry sponsorship and/or alcohol-derived income. Yet community sporting clubs also promote 'healthy lifestyles'. 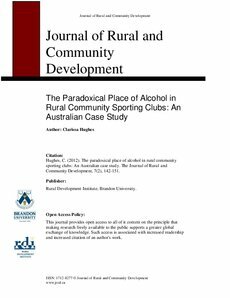 The aim of this article is to present selected results from an Australian scoping study on alcohol in community sporting clubs, with a particular focus on members' views on the place of alcohol in club culture and their receptiveness to various harm-minimisation strategies. The Knowing the Score project was conducted in Tasmania and involved a survey of 700 individuals associated with 31 sporting clubs including the Australian Football League, basketball, bowls, golf, hocky, netball and soccer. Overall, 42% of participants from licensed clubs reported that alcohol was 'very important' or 'important' for celebrating after a match/game. Alcohol was considered 'very important' or 'important' for clubs' financial wellbeing by 74% of AFL club participants and 64% of bowls participants. Alcohol was the most commonly identified problematic drug, across all sports. With respect to harm-minimisation strategies, participants indicated the most support for designated driver programs and the least support for banning alcohol sponsorship. Alcohol occupies a paradoxical place in many community sporting clubs. It is recognised as problematic, yet its consumption remains a highly valued aspect of club culture. Efforts of clubs to implement harm-minimisation strategies may be hampered by lack of support from members and a deficient evidence base, and rural clubs may be additionally impeded by limited public transport and other factors. Community sporting clubs are, however, well positioned to promote behavioural/cultural change with respect to alcohol use.